Last week I wrote a post on how to style up your central heating and make it look good in the context of your decor. We talked about different types of heating and how you can hide or disguise them if you need to. 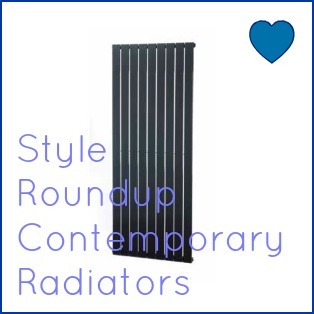 Today I wanted to look at radiators in more detail and showcase some of the styles that I love, that are popular right now and how updating your radiators needn’t be an onerous task. One area of the home where it’s great to play around with the style and look of the radiators you choose is in the Bathroom. 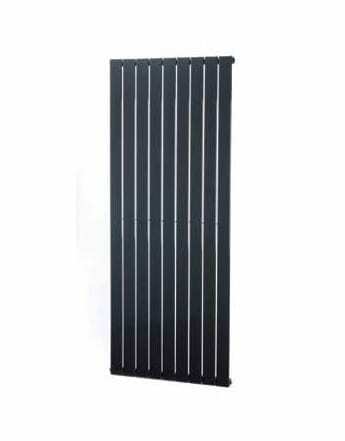 We could all do with a towel heater of some sorts and choosing and installing a ladder radiator is relatively straight forward. Tall ladder radiators are great space savers too, if like in my bathroom space is very tight. This lovely traditional heated towel rail looks beautiful and is practical and functional too. When you are updating the decor in a room, it’s well worth considering a change of radiator too. There is a huge range of modern and contemporary styles available now that will really enhance the look of your room. And many of them save precious wall space too. For example, I’m loving this contemporary radiator from Delonghi with a satin anthracite finish which would be ideal on a feature wall. The thing I love about these styles is that they don’t have to be hidden away! Of course you do have to pay for designer style and this one in 1800mmx680mm is around £260. 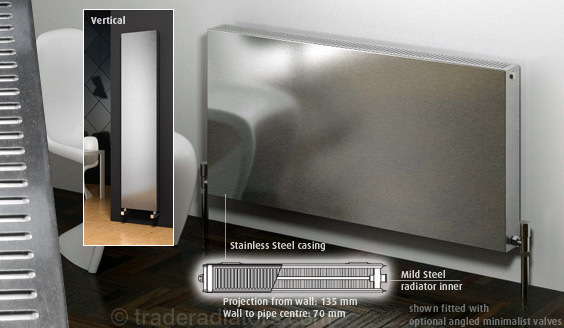 Stainless Steel Flat Panel Radiators are another modern choice and look very different. Suitable for a contemporary home they are a real talking point. Doesn’t the vertical version look brilliant? Again designer style isn’t always cheap and a 600×600 will cost you around £270. Compared to a standard radiator from a DIY store at around £100 you are paying for that extra style, and it depends if this is important to you and the overall look of your room. If you live in a period property (or even if you don’t) and want to retain period features cast iron radiators are the way to go. Still popular you can visit your local reclamation yard and get an original. Get it dipped and painted, ready to do on the wall, and you or your plumber can do the rest. If you’re lucky enough to have these in your home already, you can use all kinds of techniques to update or change them you want to. They can be sprayed and polished to any colour that matches your decor and can be a real feature in the room, or simply enhance a look. So, there you go. A little round up of radiator styles available and what you can do with them to enhance your home interiors. It’s really worth thinking about updating the radiator, many people don’t, but it will give your room a real wow factor and you’ll be pleased you did it!